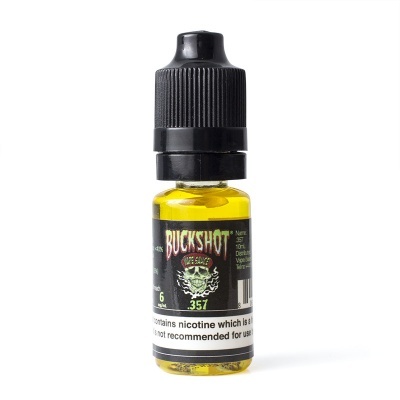 The Buckshot .357 E-Liquid is a combination of flavours, blending watermelon and strawberries together with added menthol to create a refreshing and minty taste. Buckshot was developed by a husband-and-wife team who wanted to create different flavours that could be vaped all day long rather than being restricted by taste. The .357 E-Juice is available in a range of strengths and one size. The .357 is a unique blend of flavours, creating a refreshing, light and fruity taste. Strawberries and watermelon combine together for a sweet sensation while the mentholated element of the juice cuts through that sweetness with a hint of mint and freshness.